I think I might have a bit of knitting ADD lately. I can't seem to stop casting on new projects. I have no less than 3 projects sitting on needles right now that barely have more than 2-3 rows. So not like me! I think I'm just getting anxious to use of some of this beautiful yarn in my stash, and I have so many ideas! I did manage to stop casting on new projects long enough to finish Finn's sweater. I really like how it turned out once I added an extra 2 inches to the sleeves. I'm surprised that this is the size 4-6 version though, because I don't think it will fit him past this winter. He's not an overly large kid either. I think if I had to make it over again, I would add 2 inches to the length and 2.5-3 inches to the sleeves to make it last longer. 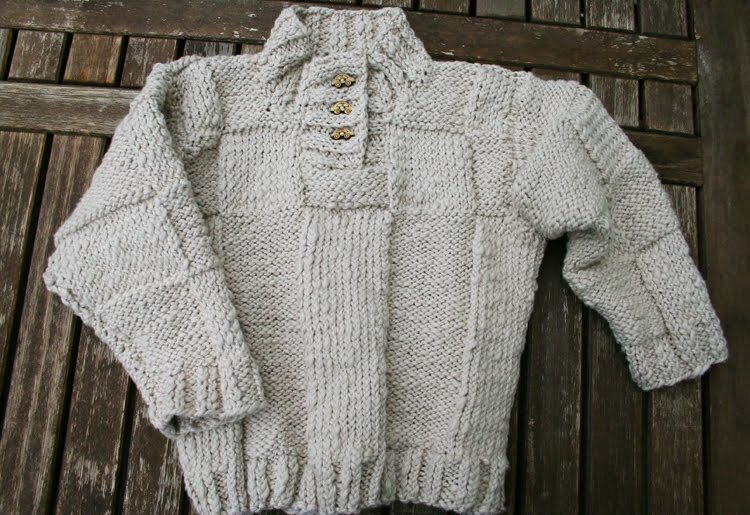 The soft cotton yarn is really yummy though, and I hope he'll get lots of use out of it this winter. The car buttons were totally added for Finn's benefit. He's less than thrilled to wear any sweater that doesn't involve vehicles somehow. 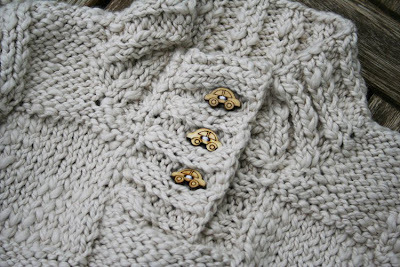 I actually fudged the collar a bit since I only had 3 car buttons left, but the pattern for this size called for 4 buttons. I think it worked out just fine. I won't bore you with all the many projects that I cast on this week, but I did want to share these socks. I'm braving the world of adult socks again with this Ty-Dy Socks superwash wool yarn. The ribbed socks seem to be going better for me so I stuck with a ribbed pattern for these. 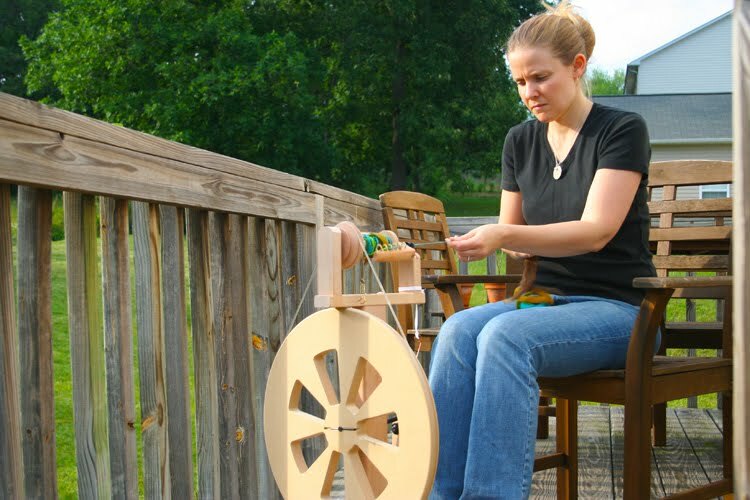 My dear husband gifted me with a spinning wheel lesson for Mother's Day which seemed like a good fit since the spinning wheel he gifted me for Christmas has been sitting in the corner of our bedroom since then. 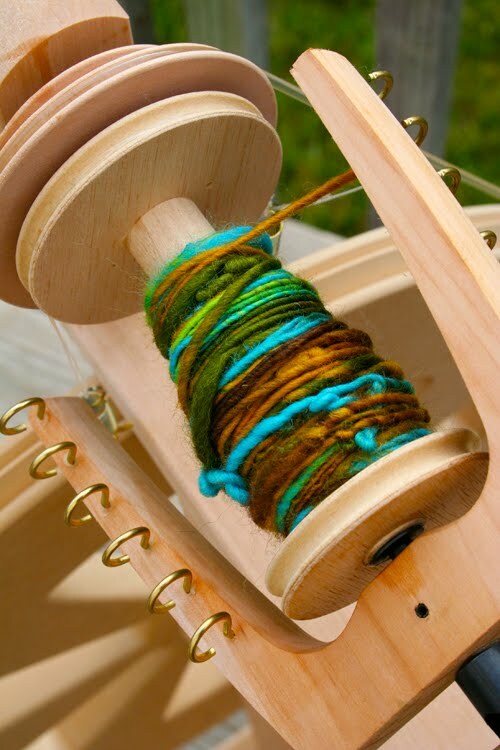 With my background in felting and, of course, knitting, learning to spin seemed like a natural progression, and as I hoped, spinning came fairly naturally to my fingers. Oh, don't get me wrong...there are plenty of improvements to be made, but just taking the first lesson, I'm sure I can practice through some of my flaws. My husband always comments on my "intense forehead" when I'm concentrating on something, now I see what he means. That is hard-core, Joy! I think it is really cool that you are learning to spin. Oh the spinning!!! Oh the jealousy!! That sweater is beautiful! 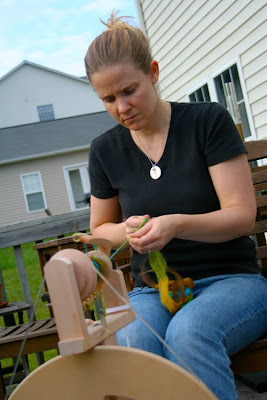 I am hoping to take a spinning lesson someday too-maybe this fall. Love the sweater! It is gorgeous! And the spinning wheel -- so cool, Joy!! nice to see YOU! & i'm glad your yarn is a little flawed too...although, it certainly adds character! & even 'flawed' it's gorgeous! I think a wheel is on my horizon too, the progression is difficult to stop! You sure DO look like you are concentrating, but I can see why! Beautiful yarn color. And that sweater for Finn is nothing short of gorgeous! The car buttons are just too cute. I'll bet he loves it. It's all so beautiful Joy, I like the photos of you spinning! All such wonderful projects Joy:) I am so excited that you are spinning, go mama!! 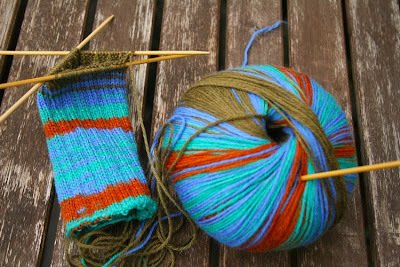 I very much have kniting ADD these days. I looked at all my half started projects ===eh! I'd love to take a spinning class at some point. That yarn is lovely that you are making! That's awesome! Good work! I love Finn's sweater... I wish I could knit. One day... until then I'll keep up with the crocheting. The spun wool is so pretty, I love the colors! And you are gorgeous, too! So nice to see you in action! The sweater is fabulously beautiful. So cozy and sweet. Oh! and the socks are gorgeous! Wow--it would take me 14 years to knit that sweater. And spinning too! You need to go to the Folk School sometime. You'd be in heaven!